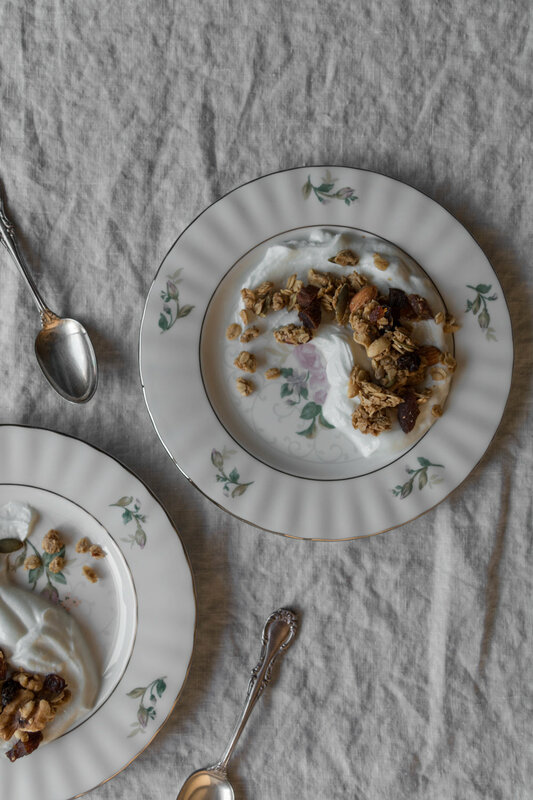 Granola is a favorite make-ahead breakfast recipe of mine, easily sprinkled over a dollop of yogurt, with a bit of milk and fresh berries, or had by itself as a snack. It only requires a minute or two to whip together; once the oats and nuts and seeds are all gathered, a syrup of olive oil along with natural sweeteners and nut butter is quickly whisked together to help along the flavor, tossed into the bowl to coat the oats with a rich and nutty sweetness. I just adore the unexpected, subtle depth that olive oil imparts and prefer to use it over other oils when making homemade granola. I use a ratio here of 3:1 with oats to nuts and seeds, adding the same ratio of dried fruit as well if I have some on hand. Feel free to tweak the sweetness and the ingredient amounts to your liking, and you can leave out anything that doesn’t suit your taste. 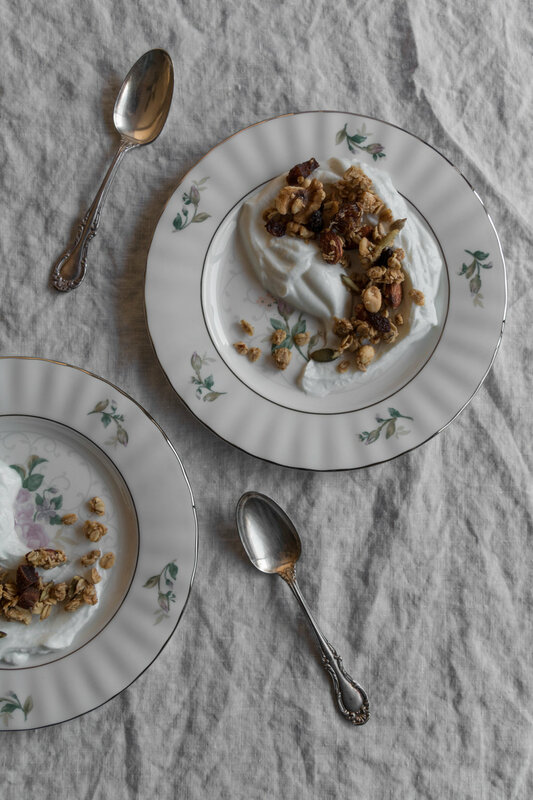 This granola could even be made grain-free - swap out the oats and replace with shaved coconut and some extra nuts and seeds to bulk it up. Or if you’re one to prefer an oat-only granola, leave out all the other additions besides the syrup ingredients. The recipe below makes a whopping batch as I like to have plenty extra on hand for sending home with friends and family members after a visit, but you may halve the recipe if there’s less of a crowd to feed. 2 cups assorted nuts and seeds - I like a mixture of almonds, peanuts, walnuts, pumpkin seeds, sunflower seeds and occasionally sesame seeds. 2 cups dried fruit - I used chopped medjool dates, unsulfured dried Turkish apricots, and Thomson raisins. 1/4 cup nut butter - I like to use almond butter, peanut butter, or a mixture of both. *I like to make a massive batch to send off with family and friends after a visit, but you can easily halve the recipe. In a large mixing bowl, stir together the oats and the nut and seed mixture. In a separate bowl, whisk together the olive oil, maple syrup, honey, nut butter, vanilla and salt. Pour the wet ingredients over the oat mixture and stir until coated. 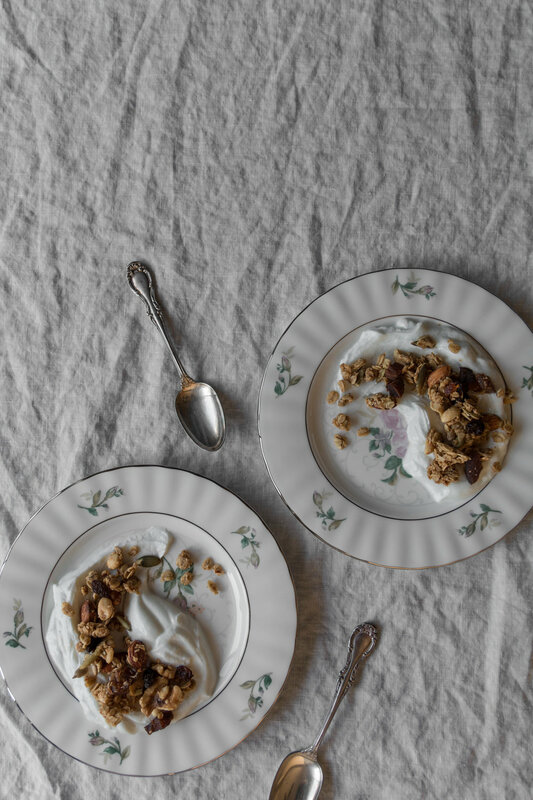 Spoon the granola onto two parchment lined baking sheets, patting down the granola with a spoon until it’s formed an even layer on both sheets. 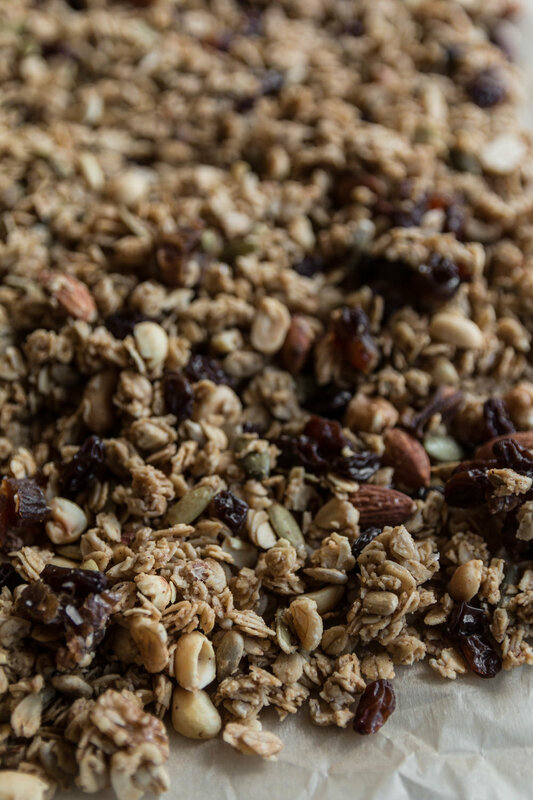 Bake in the oven for 25 minutes, then take the granola out and stir it to ensure even toasting, and rotate the baking sheets when returning them to the oven. Bake for another 20 minutes then allow to cool completely on the pans, undisturbed, so that the granola can clump together a bit. 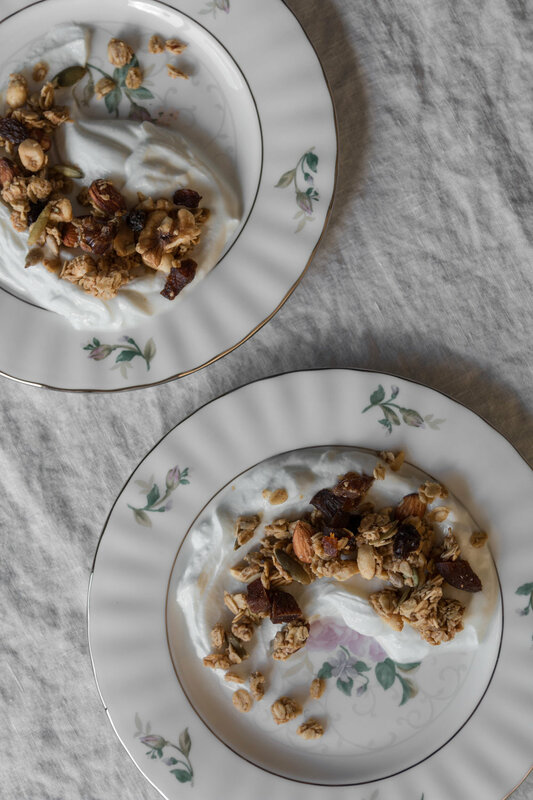 While cooling, sprinkle the granola with the dried fruit. A pot of richly fragrant sauce bubbling on the stove can help counter the chill of drizzly weather this time of year. This hearty bolognese sports bits of flavorsome pork and beef perfumed with herbs and simmered alongside onion and celery in a bath of wine and tomatoes. Though it’s up for debate whether the recipe below would be technically classified bolognese or ragu depending on the wine you use, it’s indisputably delicious. I chose spaghetti pasta this last time around, but perhaps an even better (and more traditional) way to enjoy rich, substantial Italian sauces of this sort is with a pasta like tagliatelle, pappardelle, or rigatoni - these pastas have plenty of surface area to carry an ample sauce. However, if you happen to have some spaghetti on hand in a little corner of your pantry like I did, that will do nicely. Be sure to give the sauce a good amount of time to simmer away, about two hours if you can, as this will cut the acidity of the tomatoes and create a rich, decadent sauce with delectable depth in flavor. 1/2 cup wine - I prefer red, but white is lovely too. 1 lb spaghetti or your preferred pasta - tagliatelle, pappardelle, or rigatoni would be wonderful as well. *I prefer half pork and half beef for this recipe, however, a whole pound of one or the other will do. Ground Italian sausage would be a delicious substitute for the pork as well to accompany the beef. Ask at the butcher counter for 8 oz of each, but if you can only find 1 lb portions at your market, you can always make double the recipe and freeze half for another time in a large freezer-safe ziplock bag after cooling the sauce completely (if freezing, omit the cream). If you decide to do so, place the bag of frozen sauce in the fridge the night before you want to serve it to thaw, then heat in a saucepan until piping hot. In a dutch oven or large pot, heat a splash of olive oil over medium heat until shimmering and add the onion and celery. Stir every so often and once the onions are translucent and beginning to caramelize, add the ground meat. Cook until browned, add the herbs and garlic with a bit of salt and pepper, and cook until the herbs and garlic are fragrant, about a minute. When the meat is cooked through and browning on the bottom of the pan, pour in the wine to sfumare, or deglaze, the browned bits. Stir and allow the wine to reduce for a minute, then add the crushed tomatoes and a pinch of sugar. Turn the heat to low and allow to simmer for 2 hours. When the sauce has cooked for about 2 hours, bring a salted pot of water to a boil and cook the pasta until al dente. Taste the sauce while the pasta cooks and add salt and pepper if needed. Drain the pasta, top with sauce, and grate a generous amount fresh parmesan over the top. I have a habit of making a salad of arugula and roasted vegetables at least twice a week. I like to use whatever’s in my pantry, usually potatoes and sometimes white beans for extra substance, along with whatever fresh vegetables I have on hand. This time, a head of cauliflower was asking to be used and so into the oven it went with the potatoes. After roasting, the potatoes become browned and slightly crisp and the cauliflower’s charred florets impart a wholly different, deeper flavor than had it been tossed in the salad raw. The dressing splashed over it all at the end has an interesting mélange of ingredients that don’t seem to go together at first, like mustard and mint leaves, but I promise it’s delicious. I adore using tahini in dressings as it gives it the creamiest texture without being heavy to any extent. A whole head of garlic that’s roasted along with the vegetables is blended in with the dressing, coating each bite with a bit of its savory personality. *This will give you a good amount of dressing; save the extra in the fridge for another day. For a plain and pure tahini dressing with only four ingredients, try this one instead. Place the cauliflower and the potatoes on separate baking sheets. Sprinkle the chili powder, cumin, and paprika over the cauliflower and drizzle with a generous amount of oil and toss to coat. Toss the potatoes with oil as well, tossing to coat. Spread the cauliflower and the potato evenly in their pans to ensure even browning. Top both pans with salt and pepper. Chop the head of garlic (for the dressing) in half and place in aluminum foil, drizzling with olive oil to coat. Fold the foil into a packet and place it on one of the baking pans with the vegetables. Roast the cauliflower, potatoes, and garlic in the oven for 35 minutes or until the potatoes are golden and the cauliflower is ever so slightly charred. Remove the garlic from the foil and allow to cool. Warm the beans in a small saucepan or in the microwave. Add salt and pepper to taste. To make the dressing, place all ingredients in a food processor or small blender, squeezing the roasted garlic out of its skin. Pulse until combined. Should you not have a processor or blender on hand, Whisk the liquid ingredients together, finely chop the mint, mash the roasted garlic, and then add the mint and the garlic to the liquids and whisk. Add more water depending on the desired consistency of the dressing. Add salt and pepper to taste. Place the arugula in your serving dish. Add the potatoes and cauliflower (now slightly cooled), the warmed beans, and a splash of the dressing. Toss to coat, and serve.